New England Biochar LLC came into being when business partners Peter Hirst and Bob Wells decided that it was time to formalize their working relationship. Up until that point they had spent many days and long nights exploring every different form of char making device or process that they could build in the pursuit of a simple, safe, and reliable way of turning local biomass into charcoal. 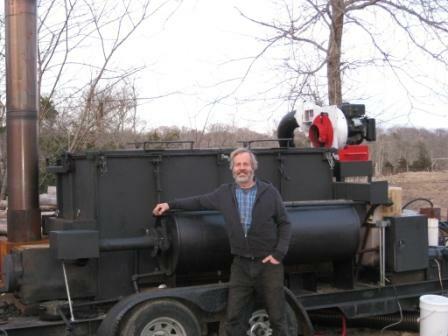 Originally Bob, a farmer in Massachusetts, United States, was motivated to make as much biochar as he could in order to supercharge the weak and sandy soil of his little organic farm on Cape Cod. Peter wanted charcoal to use in his quest for carbon neutral blacksmithing fuel. Eventually they came to see that the potential benefits of what they were doing were much bigger than they had originally imagined. To make the best possible biochar. To harvest all the available energy from the process to offset fossil fuels. To make the process safe and smoke free. Bob and Peter decided to keep their process as low tech as possible in order to meet challenge #4 and yet recognized the need to pass strict regulatory standards in different locations. 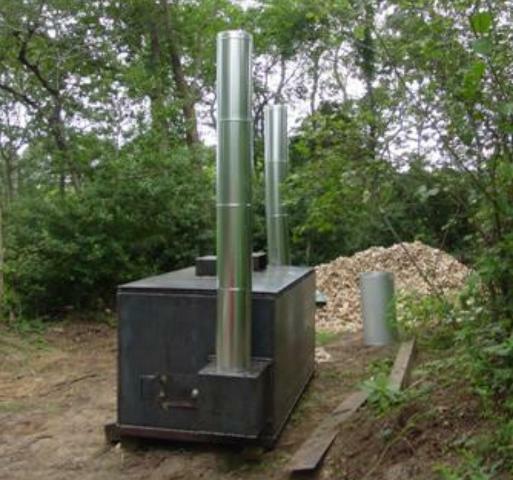 They looked into the Adam retort—a retort designed by Chris Adam in order to enable charcoal makers in undeveloped countries to efficiently make fuel charcoal out of local biomass while eliminating 75% of the smoke that commonly caused serious health problems—not just for the colliers themselves but also for the surrounding communities. Peter was very interested in the Adam retort, and they ordered the plans from Chris who was living in Ethiopia at the time. The design was for a masonry retort that seemed very elegant in its simplicity. However, the team was looking for something that could be moved from place to place so that they could take it to the feedstock or potentially do onsite contract pyrolyzing for other people. They made the decision to convert the plans into a steel structure instead of a masonry structure. It was a step up technologically, but with Peter being a blacksmith, and Bob with a background as a machinist and welder, steel was a much more comfortable medium for both of them. Their first steel prototype followed the original plan very closely. Once built, they now had the means to make much bigger batches of char than ever before. However, Bob felt the design could be improved to bring them closer to their four goals. For instance, there was no provision for harvesting energy in the original format. He also was determined to make the final 25% of that smoke pollution disappear. And of course every percentage point of efficiency that they could squeeze out of the yield meant better economic benefits as well. As Peter and Bob progressed step by step in development of the retort, they also started conducting classes and workshops on biochar for organizations all around the northeast United States. They have done demonstrations, classes, and workshops for universities, garden clubs, organic farmers, farm bureaus, high schools, and a number of other educational organizations and found that people are hungry to know more about biochar wherever they go. They were also privileged to give poster presentations at the US Biochar Conference in Ames Iowa as well as the IBI2010 conference in Rio de Janeiro in 2010. New England Biochar has developed into three different but interconnected centers. One is education and consulting. The second is the making and selling of biochar and biochar mixes. The third is providing retorts and the associated equipment and systems to other businesses so that they can produce and market their own biochar. They have now progressed to where they can roll in with their mobile modified Adam retort and provide the service of turning biomass into biochar, while simultaneously teaching organizations about the many benefits of biochar. When not teaching or demonstrating, New England Biochar keeps their equipment running hard and fast at home in order to make as much biochar as possible for the local market. They sell a biochar/compost blend to gardeners and farmers at the local farmers’ market and through ecologically minded landscapers. Retort; all photos courtesy of New England Biochar. 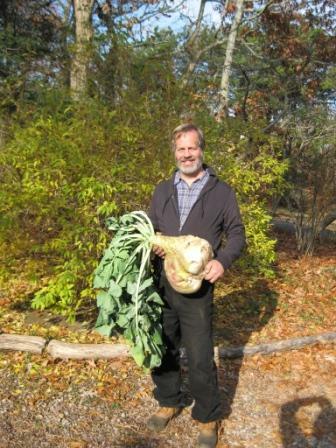 Bob with a 25 pound turnip from his fields.